The thing about Ireland is that it’s green. And whilst I had previously been under the impression that this was due to hordes of leprechauns emerging at night with watering cans, it turns out that the reality is that it’s because the clouds love Ireland. And who can blame them? It’s a lovely place, filled with colourful people, colourful houses, and a colourful history. Even if the primary colours you are going to experience are green and grey. 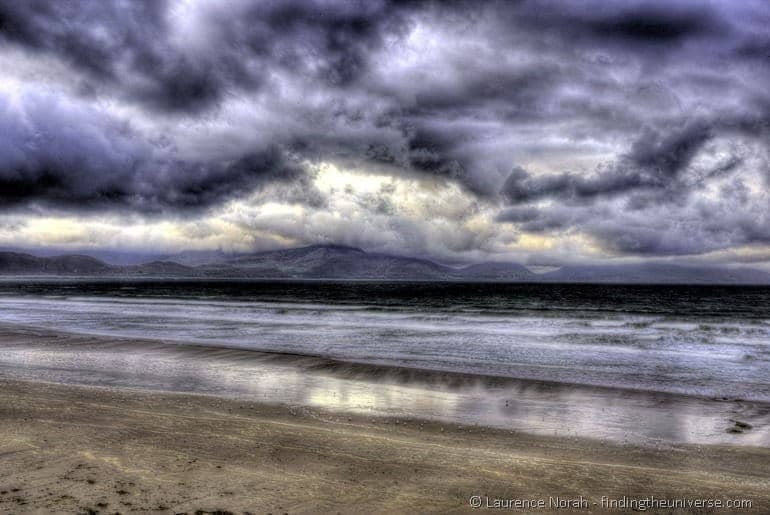 From this recent trip to Ireland, I forecast a number of moody, cloud filled posts. Starting today, with a tour of the Dingle Peninsula. Dingle is a place in Ireland, way down on the south west coast, in fact, about as far west as you can go in mainland Ireland before you fall off. It’s a place of crashing surf, lichen coated rocks and craggy fisherfolk who, despite the weather, always seem to be ready with a smile. 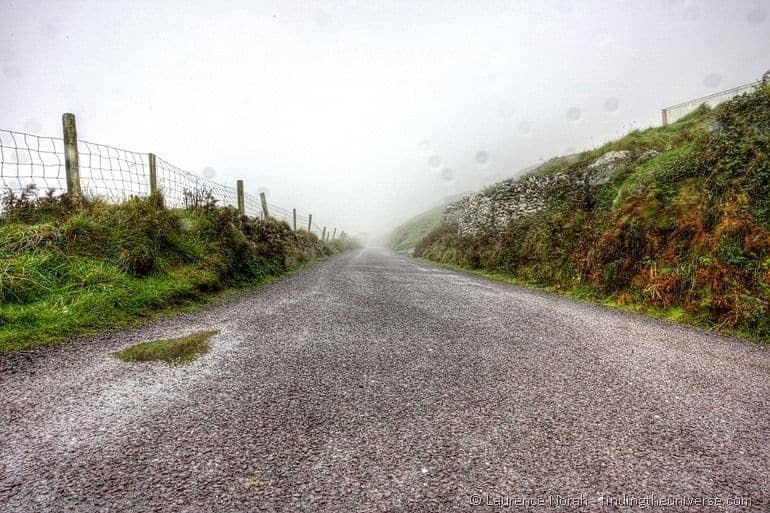 The Dingle Peninsula is home to a road, which hugs cliffs and terrifying drops, and in fact is usually only driven in one direction so as to ensure maximum survivability. It’s worth dancing with death on this road though, because the sights are superb. Even if, as you’ll notice from my photos of this adventure, the weather isn’t exactly with you. Here’s a run down of some of my highlights of a trip around the Dingle Peninsula. Surfing. I’ve only tried it once, in the warm waters of Costa Rica, and it seemed like a fun sport. Unfortunately, unless you happen to live somewhere like Hawaii, it’s also a sport that likely involves hanging around in frozen seas and turning quietly blue. Which is all very romantic of course, particularly when the beaches are as deserted and wind swept as the three mile inch beach that starts off the route around the Dingle Peninsula. We didn’t try out the surfing, but the sign indicated that it was about the cheapest place to learn in Ireland. Although seriously – I’d still recommend starting somewhere warmer. Moving on from the Inch beach, another highlight of the Dingle Peninsula is the Coumeenole Beach. At this point I should mention that we were in a coach for our trip, which limited our stopping options. To truly get a handle on the beauty of this place, I’d recommend hiring a car, and taking advantage of the many scenic viewpoints along the coast where you can stop and take it all in at your leisure. Anyway, back to the beach. This is particularly notable for being the home of the 1970 Irish film Ryan’s Daughter, which I’ve not seen. I’m told that is a great piece of filmmaking though, and I can at least say that the scenery is likely to be very, well, scenic. I’ll be adding it to my watch list, and will totally update as to what I thought afterwards. Just off the coast of Dingle, I am told, are a series of beautiful islands known as the Blaskets. I say that I am told, because the day of our visit the rain was so fierce that the sea was barely visible from the land, let alone a group of islands. These islands are remarkable for the people who lived on them, a hardy bunch of folk who between them managed to produce a copious amount of Irish literature. Clearly, eking out an existence on a group of islands being pounded by the Atlantic weather was conducive to a spot of writing, and these islanders really got their teeth into the whole prose thing. 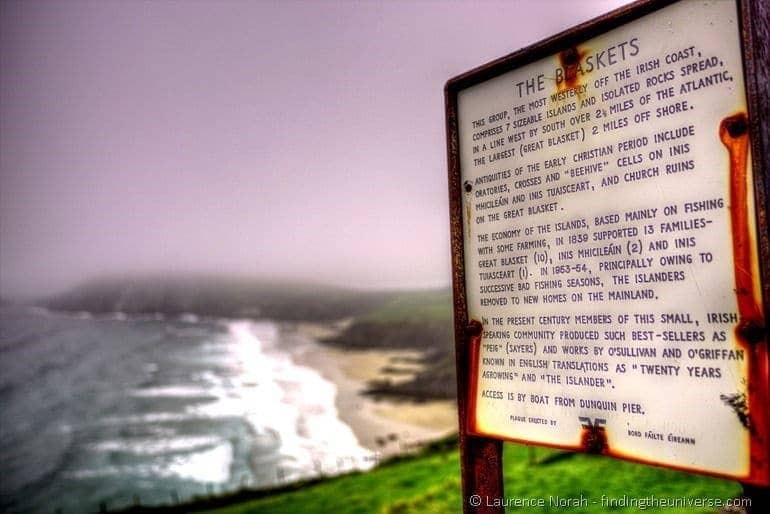 If you can’t make it over to the Blasket islands, or even see them, then I can recommend taking a bit of time to visit the Blasket Islands Centre, which is handily on the main land. 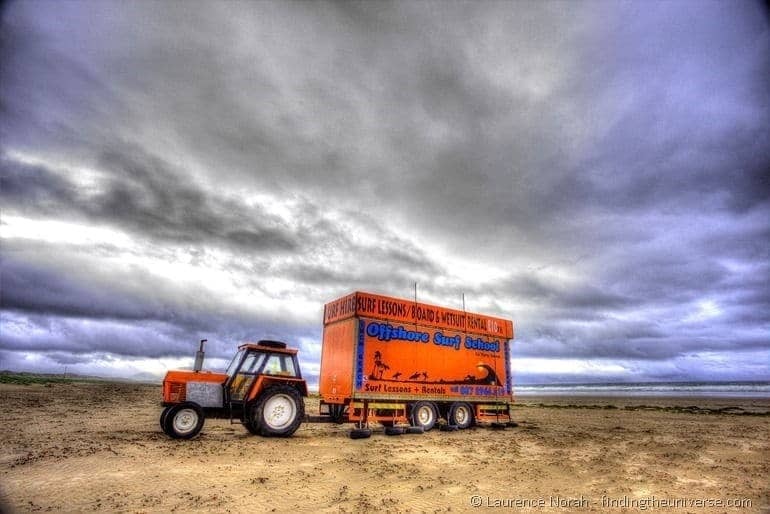 Here you can learn all about the islanders way of life, their slow migration off the islands towards the New World, and how this way of life finally ended in 1951, when the last remaining inhabitants were evacuated. It’s a moving story, and one which has been captured, in the islanders own words, in the literature they produced. Great stuff. When you arrive at the Louis Mulcahy Pottery shop on the Dingle Peninsula, you are greeted by a large sign featuring a photo of a fairly hairy man who appears to be trying to surf on a large pottery vase. Not immediately apparent in this photo is that it’s February, which in Ireland is probably not the best time of year to invent pottery vase surfing. Anyway, the chap in the photo is Louis Mulchay himself, owner of this very successful pottery business. 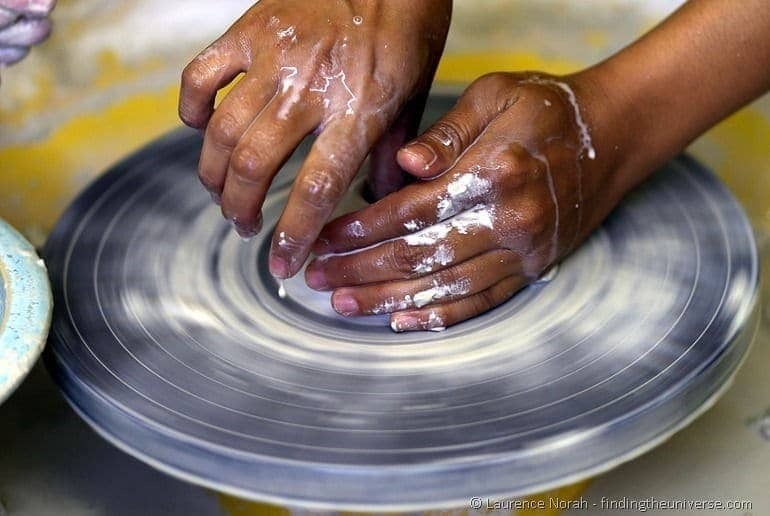 You can pop in to take a look at his works, have a go at making your very own pottery, and take a tour of the back rooms to learn all about how pottery works. Or you can just go grab some food at the excellent cafe. Which is served, naturally, on beautiful homemade plates. Ireland isn’t quite cold enough for reliable snow, which means making igloos is a bit of a challenge. 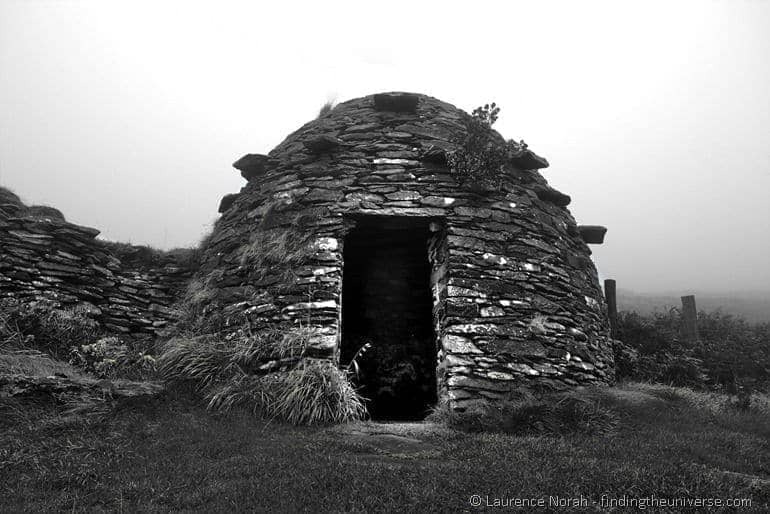 Back in the 8th century though, some bright Irish spark figured out that Irish rock was probably a far better igloo building material than ice, and so the beehive houses of DIngle were born. Presumably taking a bit longer to put together than an Igloo, the advantage of these structures becomes apparent with their longevity, as 1200 years later they are still standing fairly strong. You can wander in and stand in the dripping rain and wonder as to these early igloo builders, and what their lives might have been like. I’m guessing moist. At some point in the near future, I’m going to dip back into Dingle, as I want to share with you some of the stories of the wonderful people we met on our trip in Ireland, which is going to include the lovely man at Dingle’s own micro brewery. For now though, let us talk of Dingle itself. Visiting a town in drifting fog and light drizzle is usually an instant recipe for disaster. Having lived in Wales for a period, where the houses are often as slate grey as the sky, I am more than aware of how depressing a place can feel when the weather is against you. Dingle, though, throws these ideas of greyness to the ground. The houses are all brightly coloured, enough to lift any damp spirits. The pubs are plentiful, as are the food sources – particularly so on the day we visited, which happened to coincide with the Dingle Food Festival. We sampled tasty ice creams, classic fish and chips and delicious lamb wraps. 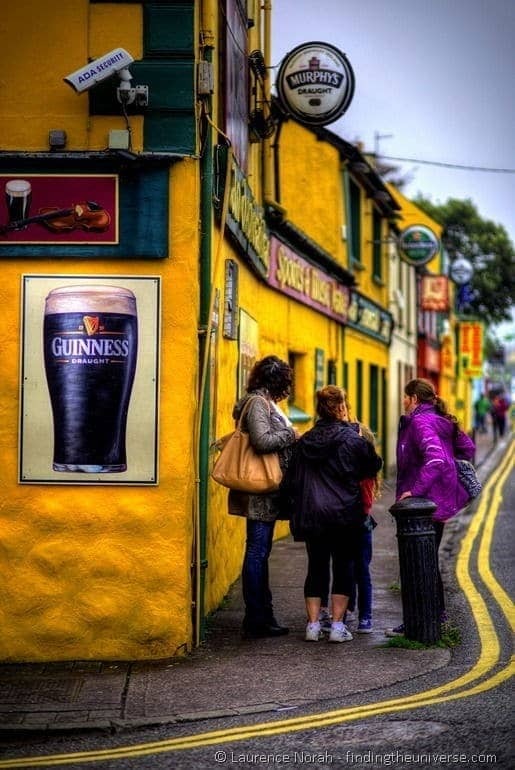 Dingle is not a place to let the weather get you down, or one where you will leave hungry, and I can very much recommend taking a bit of time during your visit here to get to know the back streets and side streets – whatever the weather! As mentioned above, Dingle is to be found way down in the south west of Ireland, some five hours or so drive from Dublin. In my opinion, your best bet is going to be to hire a car to give you all the flexibility you need in order to stop and see everything you might want to stop and see. Obviously hiring a car isn’t for everyone, what with the driving on the left and Ireland’s amazingly windy roads, in which case there are a wide variety of tour companies who will be able to sort you out with a tour, perhaps covering a number of days and including accommodation. A number of my fellow travellers chose Paddywagon as their tour operator of choice, and they had good things to say. I’m sure there are others too! And that’s it for the Dingle Peninsula! Have you been down to this part of Ireland – or is it on your to-do list? Let us know in the comments below! 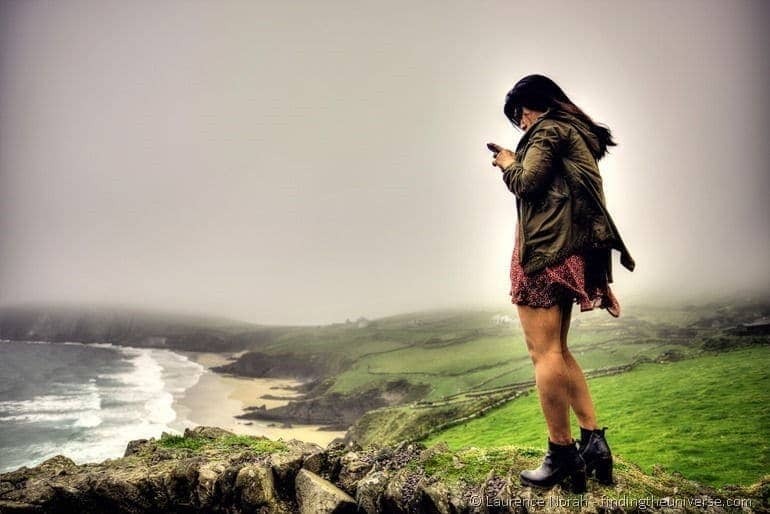 Note – my trip around the Dingle Peninsula includling transport, accomodation and food was provided by Failte Ireland in partnership with TBEX and a number of other providers. Editorial control of the blog content remains in my sticky fingers.